Come out and play in our back yard. When you think of life in the city, do you think of the great outdoors? Maybe you should. 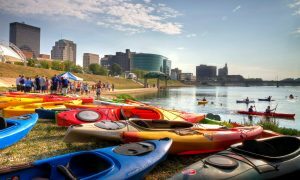 Downtown Dayton isn’t all asphalt and buildings – we’re also all about rivers and parks, sports and fitness, and a whole host of recreational opportunities to help you live an active and fun lifestyle. Whether you’re biking through city streets and bike paths, paddling on or walking along the Great Miami River, taking advantage of our recreation trail network, playing your favorite winter sport, or engaging in any number of other recreational activities, you’ll find ways to keep moving downtown. If the weather isn’t cooperating or you’re just a gym rat at heart, head inside to work out at one of the many health and fitness facilities downtown and get your heart rate up, your cardio in, and your leg day done. Feeling a little more leisurely? 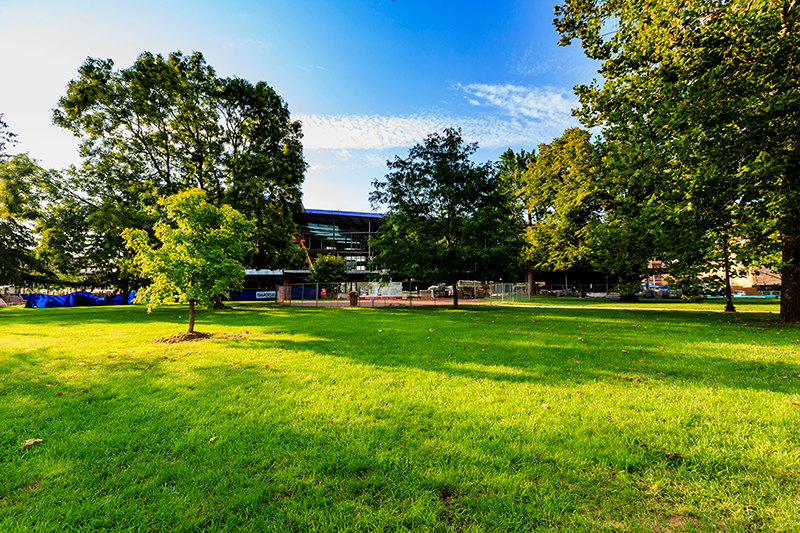 Spend a little time communing with nature or listening to live music at one of downtown’s parks, or let someone else work out while you watch at a Dragons baseball game or other spectator sport. Downtown has dozens of ways to life an active lifestyle, and it’s all right here in our back yard. Dayton loves to bike. 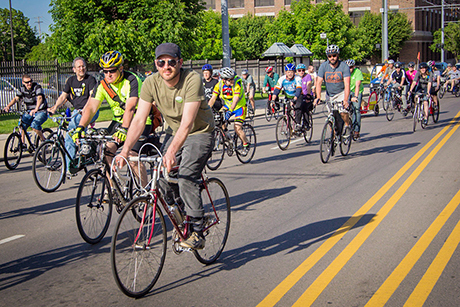 From downtown’s bike lanes and bike trails to its bike hub, bike parking, and Link – Dayton’s bike share program, it’s easy to see why the League of American Bicyclists named us a Bike-Friendly Community. Biking downtown is a great way to commute, have fun, get exercise, and get around. Learn more about our many cycling amenities and our bike-friendly downtown here. 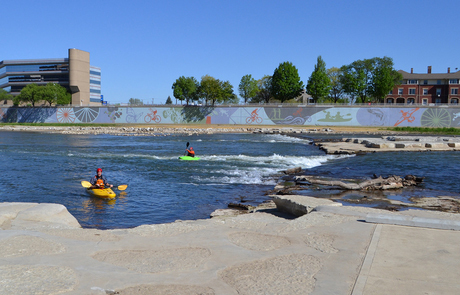 Downtown’s River Run outdoor recreation amenity at RiverScape MetroPark includes two in-river features with smooth-water and whitewater passageways spanning the Great Miami River. River Run opens the downtown river to a seven-mile paddle from Eastwood MetroPark on the Mad River, through downtown to the Carillon Historical Park and University of Dayton area. The project also allows people to fish, sunbathe and enjoy the river downtown in new ways. Learn more about River Run here. Did you know that downtown Dayton is part of more than 340 miles of paved multi-use recreational trails in five counties? That’s the largest paved trail network in the nation, and downtown Dayton is connected to all of it. 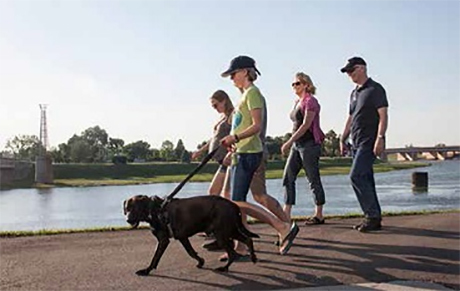 The Great Miami River, Mad River, Wolf Creek, and Stillwater River trails converge downtown, providing excellent, safe access to downtown Dayton and a great place to walk, run, bike, and enjoy the outdoors. Learn more at www.miamivalleytrails.org. Sheltered under the covered pavilion, the MetroParks Ice Rink sets the scene as a perfect winter wonderland in downtown Dayton. 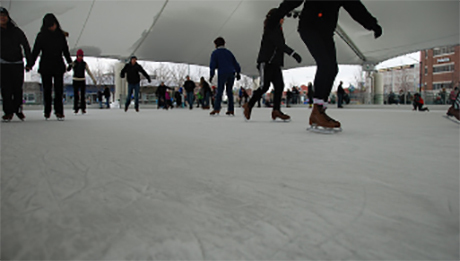 The ice rink hosts outdoor skating from the day after Thanksgiving through February. Patrons may skate daily, including holidays. While the rink is open, enjoy delicious treats from the concession stand, including a cup of hot chocolate. Take advantage of fun skating activities, such as lessons, themed skating nights and more. Visit www.metroparks.org to learn more about available lessons and the schedule of upcoming programs and events. 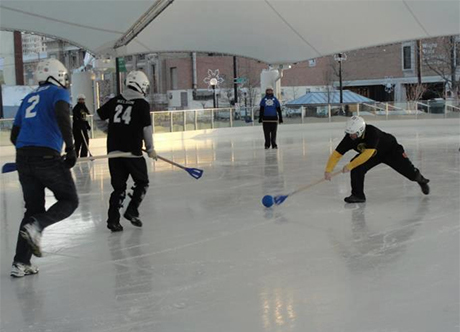 Broomball is a team sport in which players wear shoes rather than skates and use a “broom” (a stick shaped like a broom) to move the ball around the ice and score goals. Rules and strategies are similar to those of ice hockey. Winter leagues play at the MetroParks Ice Rink. Form a team and join the league, or just watch others play this fun sport downtown. To learn more, visit www.DaytonBroomball.org. Want to play an Olympic sport? 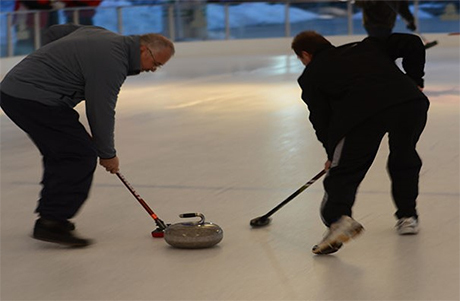 Grab some friends and sign up for the curling league at RiverScape MetroPark! This team sport involves sliding heavy, granite stones across the ice toward a marked target while your teammates sweep the ice with brooms to alter its path. Curling is accessible to all physical skill levels and no experience is required. Visit www.curltroy.org to learn more and to register your team. Several downtown businesses offer great opportunities for recreation, as well. Whether you want to learn Japanese martial arts at Ohio Budokan, get your kids started in sports at Soccer Shots, combine biking and drinking on one of downtown’s pedal pubs, or try rock climbing inside an old church at Urban Krag, you’ll find plenty of unique ways to live an active lifestyle in downtown Dayton. 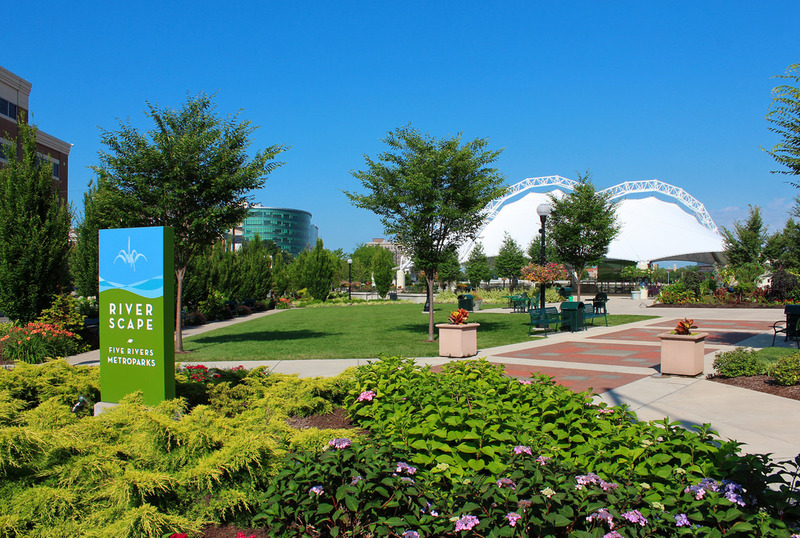 RiverScape is a park where people of all ages come to listen to live music, enjoy cultural festivals, and enjoy the outdoors. It is also a place where both kids and adults can learn about Dayton’s history and the many inventions that were born here – including the cash register, the pop top can, and the Wright Brothers’ famous airplane. Festival Plaza features lovely flower gardens and reflecting pools and a playful, interactive fountain where kids can cool off on a hot summer day. In the winter, the RiverScape pavilion transforms into a winter wonderland complete with an ice skating rink. Learn more at metroparks.org. 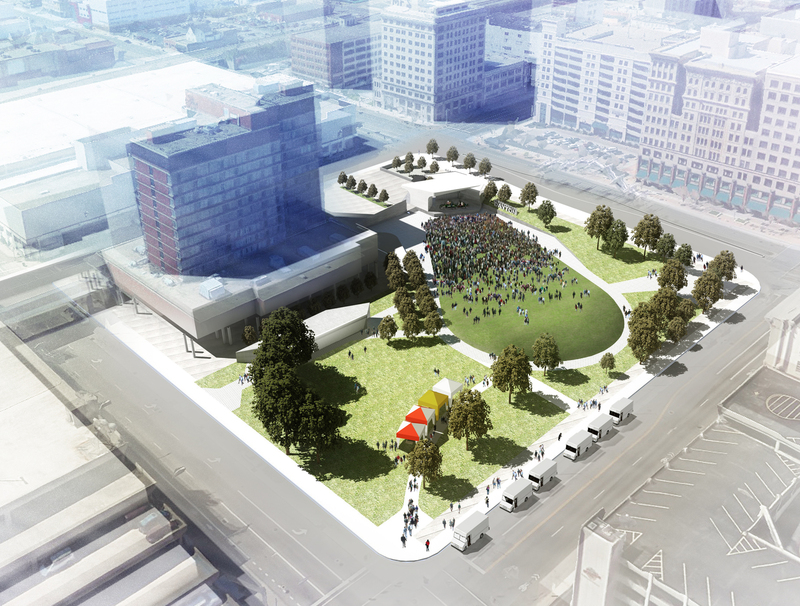 Construction is underway for the new Levitt Pavilion Dayton, a state-of-the-art music venue in downtown Dayton. The pavilion is slated to open in 2018 with a partial season of about 30 performances, followed by at least 50 free programs per year in subsequent seasons. Levitt’s community concerts will feature local, regional national and international musicians, with an emphasis on creative and diverse programming. When completed, it will become the eighth signature Levitt Pavilion nationwide. For more information, visit www.levittdayton.org. Bordered by Second Street, St. Clair Street, Patterson Boulevard, and the downtown Main Library, Cooper Park provides green space for residents in the Cooper Lofts, Ice Avenue Lofts and Cooper Place, as well as visitors to the library. This small, triangle-shaped park is formed by the convergence of Patterson Boulevard and St. Clair Street between Fourth and Fifth streets. Downtown has plenty of places to get a great workout. From full-service health clubs and spas to yoga, rock climbing, and an old-school boxing gym, you’ll find a place to sweat and enjoy doing it. This is where we root, root, root for the home team. 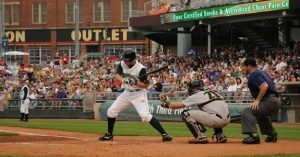 Fifth Third Field is home to Minor League Baseball’s Dayton Dragons – a Class A affiliate of the Cincinnati Reds. 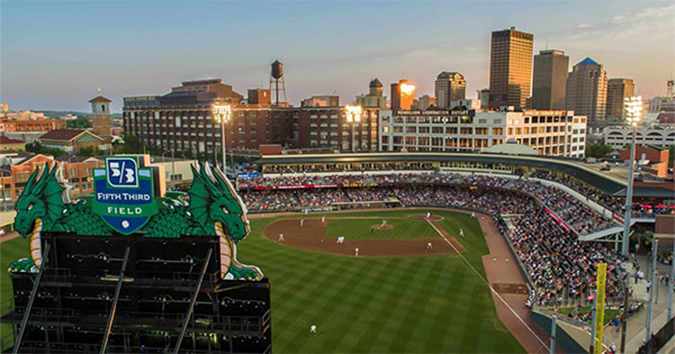 Dragons games are always a fun family affair, and are extremely popular – the Dragons hold the record for the most consecutive sellouts in all of professional sports! Fifth Third Field holds more than 7,000 seats, plus lawn seating, party decks, a Dragons Lair, luxury suites, a 7-story LED scoreboard, and plenty of great ballpark concessions. More info on Fifth Third Field and the Dragons can be found here. Roger Glass Stadium, Home of the Chaminade Julienne Eagles, is the home stadium for the school’s football, men’s and women’s soccer, and men’s and women’s lacrosse teams, as well as Eagle Pride. The facility opened in August 2016. Also on CJ’s campus is the Eagle Tennis Center, Eagle Field and a student conditioning center. 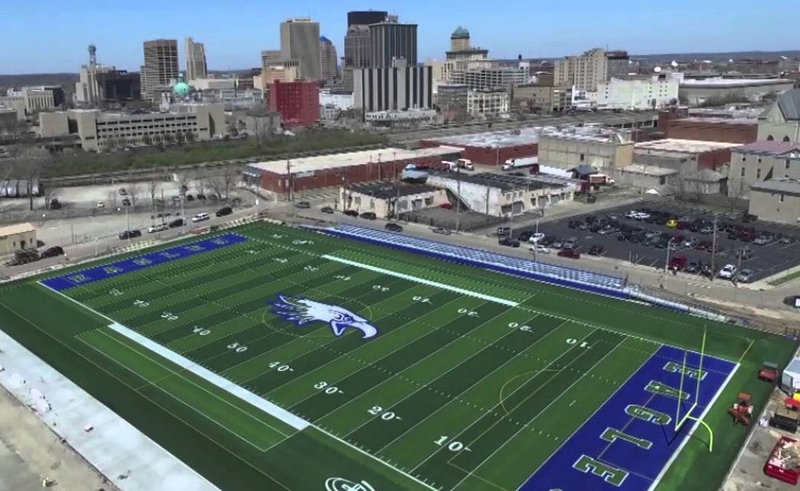 For more information on Roger Glass Stadium, game day policies, and CJ athletics, visit www.cjeagles.org.